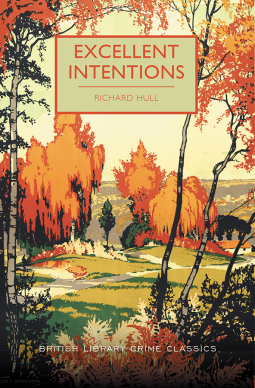 Well, looking at the cover, one ought to feel like ‘Excellent Intentions’ would be a nice autumn read! It was first published 80 years ago, but recently it was selected to be part of the British Library Crime Classics series, and it’s published (with the new autumny cover!) again on the 2nd of October, 2018 – a.k.a. today!! If you feel like hearing about a crime story from the Golden Age in the company of your freshly brewed coffee, read my review about it! I got this book via Poisoned Pen Press and NetGalley in exchange for my honest opinion. Being a fan of classic crime since I was about 12, I got very excited to see that even a novel as old as this one I have the opportunity to get from NetGalley! Of course, I knew that books get published again from time to time, but this was the one that actually made me consciously realize that these oldies need a hype today, as well, so publishers reach out for advanced readers in this cases, too. I was really happy to find out about this book! I haven’t read any books by Richard Hull before, though I was familiar with his name (well, I’m a Christie-fan, through and through :D). This book has the atmosphere that only the old classic crime stories can give. People might try/might have tried to mimic it later, but that’s never quite the same. The world changes, thus writers and literature change, too. I love crime stories of all subgenre, of all times, but it’s nice to sometimes just sink into the slow and simple vibe of old times. What occurred to me immediately when I opened the ebook, was that this book has a very unusual structure, and what a fantastic idea it was! Even from a quick look at the Table of Contents one already know that this book follows the procedure, the legal actions of the court, and at first I was a bit surprised that the whole novel seemed to be set in the court room. It wasn’t at all boring, though, because as it turned out, the court room scenes kind of gave a frame to the whole story, and though the narration always ‘checked back’ on it, it explored the earlier happenings as well. I found it to be a very interesting take on a crime story, though I have to admit that there were a few times when I had to read some lines twice because there were simply no clear transition between the timelines. It was also a bit disproportional, too. The first two parts, especially the second were incredibly long, and it was a bit tiring to read without real further structuring. Otherwise, it worked well. The idea that we know through the whole novel that the person who committed the crime is known and already in court (basically ‘with us’, since we are – the scenes are – in the courtroom) accused of the murder, yet we have no idea who they are, is amazing, too! I figured out who it was but that didn’t really take away from enjoying the book. All in all, I’d say everything about this book worked well for me, except for one thing: I cannot for my life feel like the murderer would actually do it. I know they did, and logically it makes all the sense it the world, it is indeed a very well worked-out story, but on the character part… I don’t know. I just can’t internalize this idea. With my mind, yes, but I just have the feeling that it doesn’t add up. For some reason I sense a bit of discrepancy between the character and the motive. But maybe that’s just me. Let’s Give It a Grade! While being a remarkable piece of the classic crime genre (with all its vibe and clear logic), this novel has a pretty unique take on this usual story (at least for a work of its time). It has a structure and point of view that I haven’t seen in other books. It’s a must-read if you’re a fan of classic crime! Black tea with some spirits in it. Vivaldi. Don’t ask why. No idea. Just came to me. As always, I won’t stop reading classic crimes. Ever. Richard Hull made the list as a writer I would read without asking when a book of his happen to be somewhere around me. Have you ever read this book? What did you think about it? Well, technically 4.25/5, but who cares? 😅 It was really good. I haven’t read anything from this author, nor the series before, but after this, The Murder of my Aunt has been added to my tbr! !